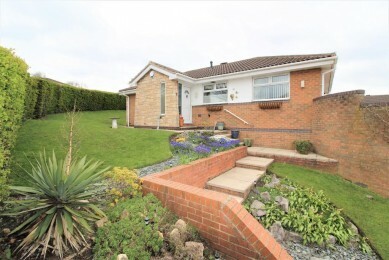 Gates estates are pleased to offer this well presented two bedroom detached bungalow located in Darton. Accommodation comprises; Kitchen, dining room, cloakroom, living room, 2 bedrooms and house bathroom. The property benefits from gas central heating, double glazing, good sized gardens and double detached garage. VIEWING ADVISED. A tastefully appointed and neutrally decorated, side facing lounge with large double glazed, bay window, radiator, feature wall, stove effect fire and modern solid oak wooden flooring. Access is provided to the Dining / Kitchen and hallway. Having a good range of modern wall and base units with roll-edge work surfaces which incorporates a ceramic sink. Integrated appliances include dishwasher and fridge/freezer. The flooring is tile effect vinyl and provides access to the cloakroom and porch. There is a double glazed window overlooking to front of the property and a further double glazed window to the dining area overlooking the side garden. Accessed upon entry to the property. It has tiling to the floors and part of the walls and includes low flush WC and pedestal wash basin. There is also plumbing and space for an automatic washing machine. A spacious front facing bedroom which is neutrally appointed with double glazed window, radiator and carpeted flooring. Spacious bathroom with large corner bath, low flush WC, sink and large shower cubicle. It has a double glazed, obscured glass window and tiled flooring. The walls are part tiled. A spacious rear facing bedroom which is neutrally appointed with double glazed window, radiator, wooden flooring and access to the gardens via a double glazed sliding door.